Through the drizzle I heard the cockerell crowing at the Spitalfields City Farm as I walked up to Columbia Rd where this Easter morning there was a lively crowd at the flower market by eight o’ clock. I deliberated between Rhubarb and Clematis before buying a tray of eight Violas for a mere £2. I love Violas with their delicate deep violet and white petals, half and half, like butterfly wings. They remind me of happy days in the Outer Hebrides where on the Isle of Barra they grow wild on the machair, the bank of seaweed built up at the top of the beach to create a narrow strip of land, that in Summer is as rich with tiny flowers as an Alpine meadow. There is a small window above the stove in my kitchen that I open to expel the steam when I am cooking, this is where I raise my eyes in contemplation while I am stirring the porridge. On the sill sits a nineteenth century Welsh lustreware creamer that I bought in Exeter many years ago, and these Violas in this tiny box will make an attractive background to my beloved cow for months to come. Nice Picture! You made an early start to have it up and running by 10a.m. I’d love some window boxes, alas my windowsills are too narrow on the outside. 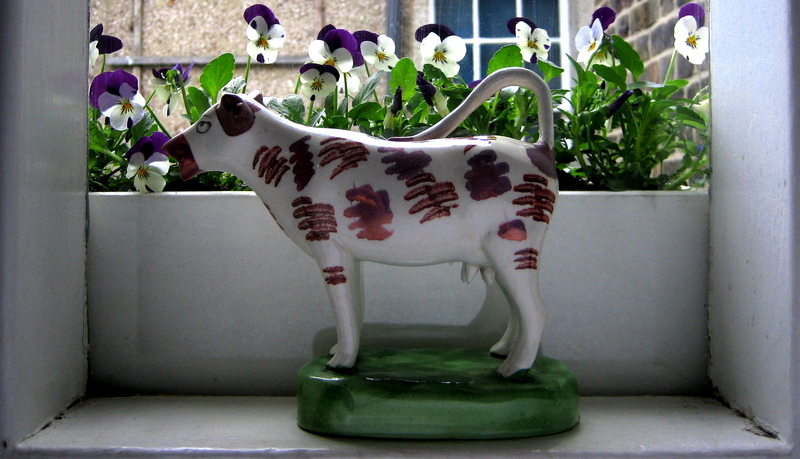 Gentle author: I just love that cow creamer on the window sill (I am assuming it’s a cow creamer). Every time I’m in London, I look for one like that that I can afford. The one you have is particularly beautiful!